Triage tools, legal portals, guided pathways. Whatever the terminology, the use of technology to gather information from service users and signpost or refer them, based on that information given, to appropriate services is a much sought after resource. Getting the model right is an undeniable challenge but there are some good international examples of how to make the right technology work in the right situations. In several jurisdictions there has been a considerable interest in recent years in developing triage tools for the legal sector. The aim of such tools is to enable users to diagnose what legal problems arise in their specific circumstances and what their most likely legal options are, rather than just providing them with general advice that they must navigate and apply to themselves. Triage tools are therefore promising to be particularly helpful for LiPs and those with limited access to legal advice/representation. So, what does best practice in the US teach us on assisting UK LiPs? One contrast drawn out specifically by Professor Smith relates to the interrelation of the services provided by ILAO, since it combines information-provision with referral and self-help assistance for LiPs. In the UK a more fragmented approach has been the norm. 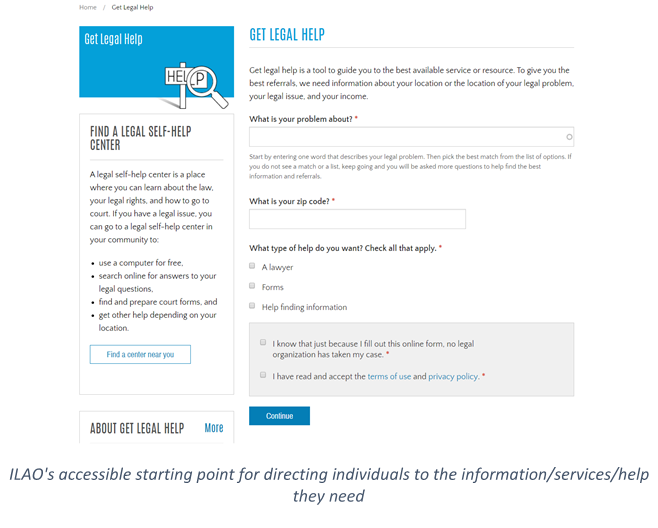 For instance, organisations such as Law for Life - with their Advice Now website- do an invaluable job in providing accessible general information on rights and the law, but this is not integrated into a wider system that individuals can easily navigate to find the kind of assistance they need. Therefore, one key take-away is clearly that ILAO presents us with a model for a “unified ‘legal portal’ which, by an automated triage process, directs persons needing legal assistance to the most appropriate form of assistance and guides [LiPs] through the entire legal process”. As Professor Smith notes, mimicking this may be particularly important in the UK where cuts to legal aid have severed a traditional progression from general advice, to professional legal assistance and (potentially) legal representation. In addition, it will be worth keeping an eye on the future developments of the ILAO model, such as the ongoing ‘Edit Now’ Project, which aims to enable lawyers to edit the site’s online content. While this is clearly an effort to capitalise on the collective expertise of a large number of legal professionals, ILAO will also seek to maintain the quality of its information by restricting editing to registered lawyers and assessing any proposed changes before they are implemented. It remains to be seen how successful this ‘crowdsourcing’ approach is in light of certain difficulties – for instance, the limited number of legal professionals – but the overall model, which it complements, is clearly a highly successful one that can serve to inspire imitation and innovation here in the UK.